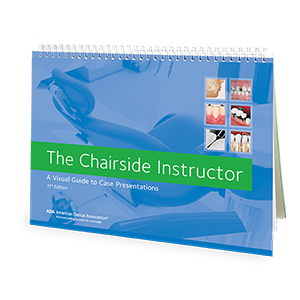 The Chairside Instructor is the ADA’s #1 patient education sourcebook, great for training dental staff to communicate clearly and consistently, and as a classroom resource for dental hygiene and assisting students. More than 250 full-color images and diagrams on 46 topics help educate patients about dental care and help the dental team learn to identify signs and symptoms, explain the importance of oral health care, discuss treatment options, and more. If you’re looking for the best dental picture guide around, the Chairside Instructor is the book for you. Containing information about a variety of care and treatment topics, this educational material is perfect for training assistants, as well as informing patients. Add useful sourcebooks to your office – order yours today! Also available in Spanish, as an e-Book, and as a mobile app for IOS. Institutional pricing available. Please contact leej@ada.org / 312.440.4649 .